Faced with the backlash, the Guardian quickly – and very quietly – rowed back its initial certainty that its story was based on verified facts. Instead, it amended the text, without acknowledging it had done so, to attribute the claims to unnamed, and uncheckable, “sources”. To underscore the intended effect of the Guardian’s new claims, Harding even throws in a casual and unsubstantiated reference to “Russians” joining Manafort in supposedly meeting Assange. The emotional impact of the Guardian story is to suggest that Assange is responsible for four years or more of Trump rule. But more significantly, it bolsters the otherwise risible claim that Assange is not a publisher – and thereby entitled to the protections of a free press, as enjoyed by the Guardian or the New York Times – but the head of an organisation engaged in espionage for a foreign power. The intention is to deeply discredit Assange, and by extension the Wikileaks organisation, in the eyes of right-thinking liberals. That, in turn, will make it much easier to silence Assange and the vital cause he represents: the use of new media to hold to account the old, corporate media and political elites through the imposition of far greater transparency. The problem for the Guardian, which should have been obvious to its editors from the outset, is that any visits by Manafort would be easily verifiable without relying on unnamed “sources”. The idea that Manafort or “Russians” could have wandered into the embassy to meet Assange even once without their trail, entry and meeting being intimately scrutinised and recorded is simply preposterous. In fact, the Guardian obtained the embassy’s logs in May, and has never made any mention of either Manafort or “Russians” being identified in them. It did not refer to the logs in its latest story. The problem with this latest fabrication is that [Ecuador’s President] Moreno had already released the visitor logs to the Mueller inquiry. Neither Manafort nor these “Russians” are in the visitor logs … What possible motive would the Ecuadorean government have for facilitating secret unrecorded visits by Paul Manafort? Furthermore it is impossible that the intelligence agency – who were in charge of the security – would not know the identity of these alleged “Russians”. That at the very least hints that the Guardian thought they had “insurance” on this story. And the only people who could have promised that kind of insurance are the security and intelligence services – presumably of Britain, the United States and / or Ecuador. Despite all this, even analysts critical of the Guardian’s behaviour have shown a glaring failure to understand that its latest coverage represents not an aberration by the paper but decisively fits with a pattern. And finally, in a bizarre tweet, Greenwald opined, “I hope the story [maligning Assange] turns out true” – apparently because maintenance of the Guardian’s reputation is more important than Assange’s fate and the right of journalists to dig up embarrassing secrets without fear of being imprisoned. Even aside from its decade-long campaign against Assange, the Guardian is far from “solid and reliable”, as Greenwald claims. It has been at the forefront of the relentless, and unhinged, attacks on Labour leader Jeremy Corbyn for prioritising the rights of Palestinians over Israel’s right to continue its belligerent occupation. Over the past three years, the Guardian has injected credibility into the Israel lobby’s desperate efforts to tar Corbyn as an anti-semite. See here, here and here. The Guardian has been vocal in the so-called “fake news” hysteria, decrying the influence of social media, the only place where leftwing dissidents have managed to find a small foothold to promote their politics and counter the corporate media narrative. Its pages, however, are readily available to the latest effort to prop up the status quo from Tony Blair, the man who led Britain, on false pretences, into the largest crime against humanity in living memory – the attack on Iraq. That “humanitarian intervention” cost the lives of many hundreds of thousands of Iraqis and created a vacuum that destabilised much of the Middle East, sucked in Islamic jihadists like al-Qaeda and ISIS, and contributed to the migrant crisis in Europe that has fuelled the resurgence of the far-right. None of that is discussed in the Guardian or considered grounds for disqualifying Blair as an arbiter of what is good for Britain and the world’s future. The Guardian also has an especial soft spot for blogger Elliot Higgins, who, aided by the Guardian, has shot to unlikely prominence as a self-styled “weapons expert”. Like Luke Harding, Higgins invariably seems ready to echo whatever the British and American security services need verifying “independently”. Higgins and his well-staffed website Bellingcat have taken on for themselves the role of arbiters of truth on many foreign affairs issues, taking a prominent role in advocating for narratives that promote US and NATO hegemony while demonising Russia, especially in highly contested arenas such as Syria. That clear partisanship should be no surprise, given that Higgins now enjoys an “academic” position at, and funding from, the Atlantic Council, a high-level, Washington-based think-tank founded to drum up support for NATO and justify its imperialist agenda. Improbably, the Guardian has adopted Higgins as the poster-boy for a supposed citizen journalism it has sought to undermine as “fake news” whenever it occurs on social media without the endorsement of state-backed organisations. Its job is to shore up a consensus on the left for attacks on leading threats to the existing, neoliberal order: whether they are a platform like Wikileaks promoting whistle-blowing against a corrupt western elite; or a politician like Jeremy Corbyn seeking to break apart the status quo on the rapacious financial industries or Israel-Palestine; or a radical leader like Hugo Chavez who threatened to overturn a damaging and exploitative US dominance of “America’s backyard”; or social media dissidents who have started to chip away at the elite-friendly narratives of corporate media, including the Guardian. 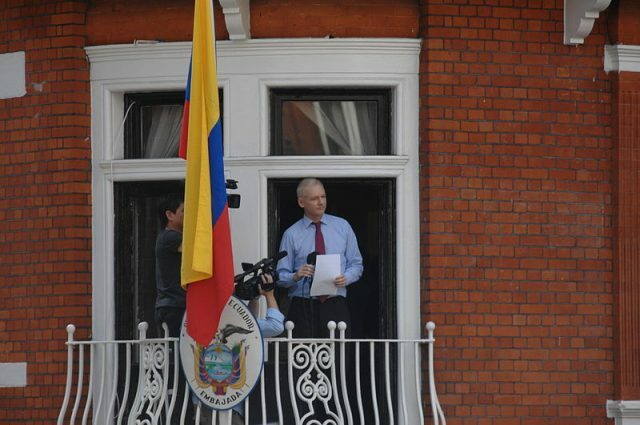 UPDATE: Excellent background from investigative journalist Gareth Porter, published shortly before Harding’s story, explains why the Guardian’s hit-piece is so important for those who want Assange out of the embassy and behind bars. Read Porter’s article here.